Mizun-awhat? Mizuna greens! Mizuna greens are lettuces that are available year round, but peak in the fall. Their flavor has a slight earthiness (as most greens do) and they look like mini, spiky arugula or a large parsley. In light of Labor Day being right around the corner, I’ve whipped up a fall-inspired dish, including pear noodles! Honestly, pear noodles have quickly become one of my favorite things to spiralize, because they completely transform themselves once they’re noodles. 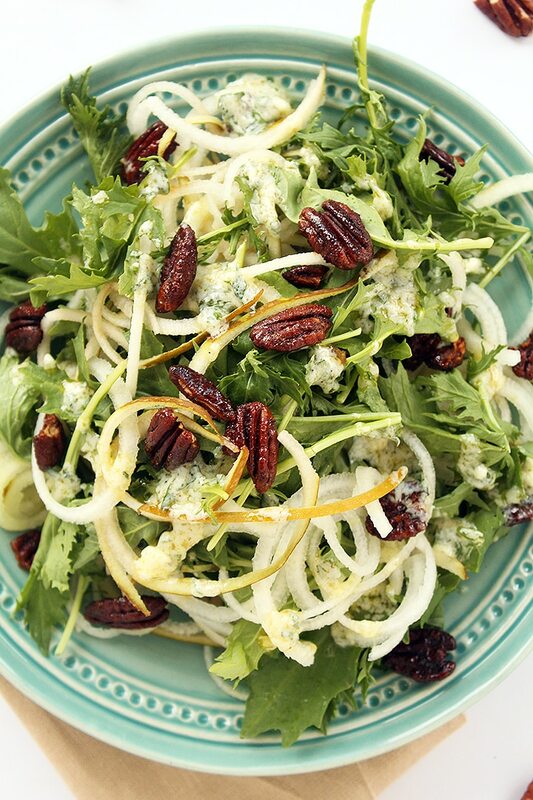 How many times can you eat a sliced pear and blue cheese salad? Only so many times! 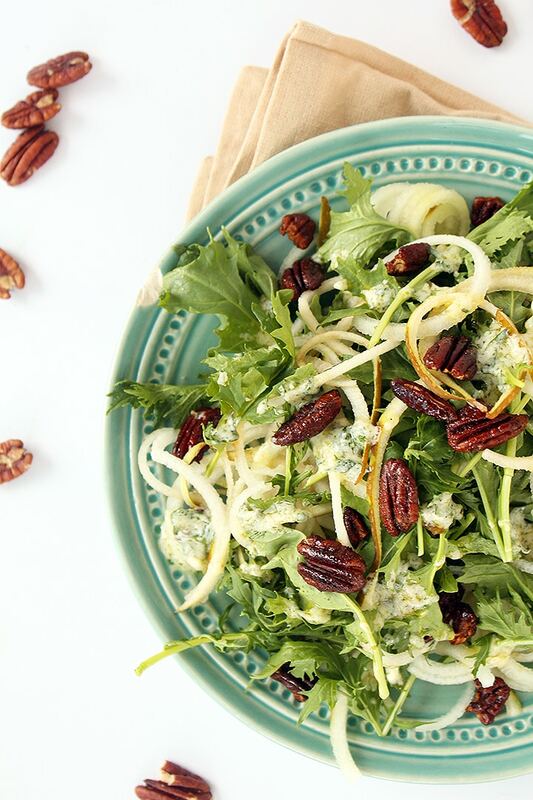 With pear noodles, you’re getting pear in every single salad bite, because once you spiralize the fruit, there’s more of it (compared to slicing or dicing.) 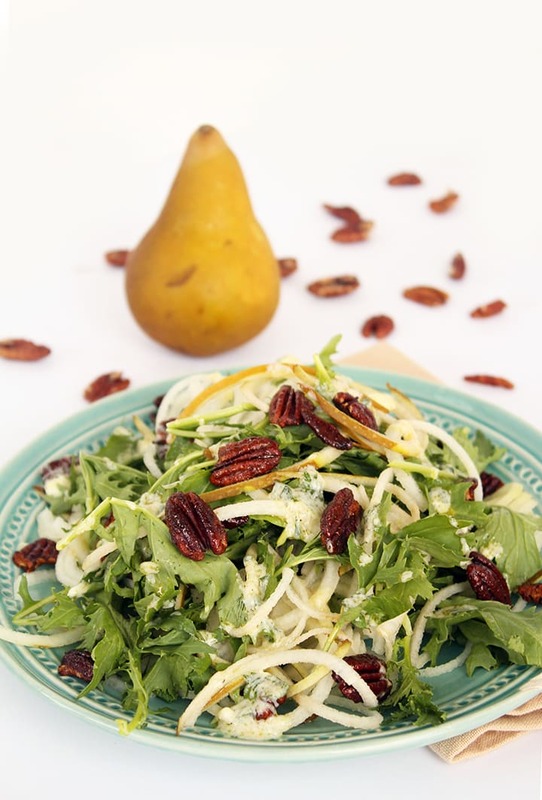 The pears won’t get lost in the salad and end up at the bottom of your plate at the end – they’ll intertwine among all the other ingredients, leaving pear-ful bites every step along the way. Don’t get mad, but I’m really looking forward to chunky sweaters and leggings. Wow, I sound like such a girl! But, it’s true. I look forward to every season, because they all have their pros. If you had asked me that back in April, when it was in the middle of the winter-that-never-ended, I probably would have paid you money to bring me summer. I couldn’t imagine living in a climate that was warm year-round. Growing up in New Jersey, you get a bit of everything. Fall is my favorite – the foliage, the crisp air, the snuggly outfits, the hot chocolate, and, of course, apple picking. There’s no better place to be than New York City during the fall. If you’re thinking of visiting, visit then. Anyway, this recipe is one we can enjoy now, in the late summer. It’s fresh parsley and goat cheese vinaigrette offers amazing texture, flavor and even color – the speckles of green and chunks of white make for a beautiful vinaigrette. Now, the pecans are what pull this dish together. At first, I was a little worried, because when I put the ingredients together, the mixture was very thick and paste-like. I wanted to avoid using egg white or any additional ingredients to thin it out, so I dumped the pecans right in the bowl, tossed them around, laid them out on a sheet, baked them and voila – the most simply made, delicious spiced pecans. Also, later that night, I used those pecans in a steak salad for Lu and I. Probably outdid myself with the pecans for the day! Overall, this salad has everything you need to start your fall off on a healthy and happy note. What fall veggie or fruit are you most looking forward to spiralizing? Preheat the oven to 325 degrees. While preheating, whisk together the honey with the cinnamon, cayenne and season lightly with salt. It should create a paste. Add the pecans into the mixture. Stir to combine thoroughly. While the pecans are baking, whisk together all of the ingredients for the dressing and mix until vinaigrette is creamy. Set aside. 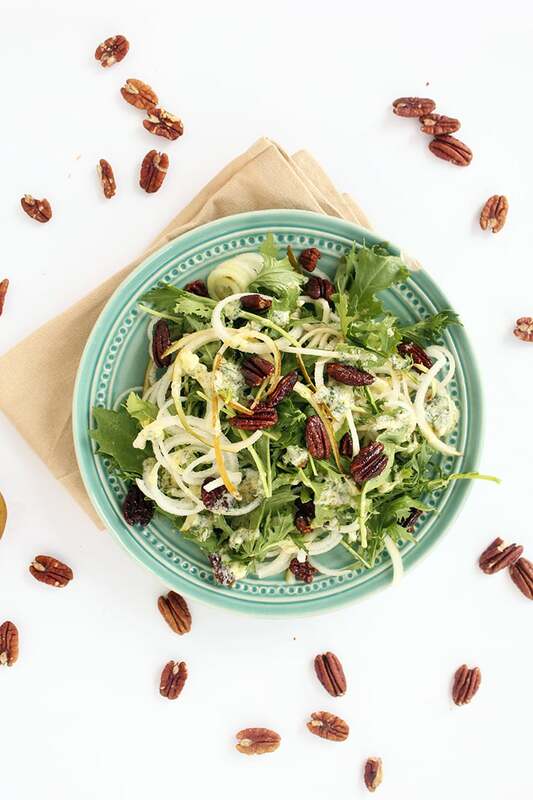 When pecans are done, place the pear noodles, mizuna greens, and pecans in a large mixing bowl, pour over the dressing and toss to thoroughly combine. Serve. I'd like to see a video on spiralizing the pears--or more detail. I would as well - not sure I understand 'noodles trimmed'. Is one type of pear better for spiralizing? Otherwise sounds delicious and can't wait to try. And I too am ready for boots and chunky sweaters… if only that wasn't followed by bone chilling temps and tons of snow! Hi Ali. Thinking the pears were Bosc from what I could see in the picture?? Help with the spiralizing of them would be great. Do I core them whole like you would an apple? Any hints would be greatly appreciated. Love, love love this website BTW. My family thinks I've gone "spirally nuts". The pecans were so good! Great salad recipe though I used argula because that's what I had on hand. I made this for my vegetarian cousin and she loved it (so did I, actually.) I did substitute Feta cheese for goat cheese because she's not a fan of the goat and I think it turned out just fine. I personally would have made it with goat cheese for myself.